Vitamin D is also known as the ‘sunshine vitamin’ because it’s predominantly generated from sun exposure. Once your skin is exposed to the sun, it motivates the production of Vitamin D in the skin. You can also get this vitamin from foods and nutritional supplements. Vitamin D aids certain essential functions in your body, which include: stimulating bone and cell growth, supporting calcium absorption, ensuring calcium and phosphate levels are normal and reducing inflammation. Several situations can lead to a deficiency in Vitamin D.
Constant use of sunblock. When you apply sunblock, it substantially blocks the sun’s capacity to stimulate the production of Vitamin D on your skin. About 10 minutes of exposure per day is enough. Lack exposure to sunlight. Living a regular indoor life is not okay for Vitamin D production. It’s good to go outdoors and take in the sun every single day if the weather allows. Not eating Vitamin D rich foods. Food sources of Vitamin D include fish, fortified mills, beef liver, egg yolks and fish oils. If you are on a strict vegan diet, you’re at risk of getting the deficiency. Dark Skin. 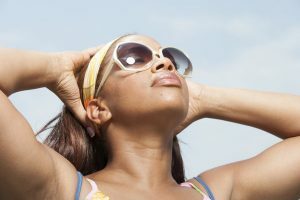 It’s harder for the sunlight to stimulate the production of Vitamin D on dark skin. So the darker your pigmentation, the higher the possibility of getting the deficiency. Medical Conditions. Some individuals with compromised kidneys are unable to turn vitamin D into its active form. Those who suffer from conditions such as cystic fibrosis, celiac disease, and chronic illnesses have intestines that are incapable of absorbing Vitamin D.
Obesity. Being overweight can also lead to deficiency because Vitamin D is removed from the blood by the fat cells thus shifting its release into the circulation. A deficiency in Vitamin D is not always symptomatic, especially in the early stages. You can therefore not rely on symptoms to determine if you have the deficiency. The most accurate test to measure the Vitamin D in your body is the 25-hydroxy vitamin D blood test. Healthy individuals should have a reading of between 20 nanograms/millimeter to 50 nanograms/millimeter. If the levels are less than 12 nanograms/millimeter, then you have a deficiency and require treatment. First and easiest way to correct the deficiency is a change of diet and use of nutritional supplements. It’s important that you also try and spend time in the sunlight so that your body can produce the vitamin through the skin. Before taking any nutritional supplements, talk to a doctor especially if you live with a chronic illness.